When I went to Paris in 2005, the warm croissants certainly set my heart aflutter, as did the cracklingly fresh baguettes and the dainty, delicate macarons. But the moment my heart almost stopped beating from the shock of deliciousness was the moment I tasted my first Pierre Hermé dessert, a dessert called H. Mogador that contained, “Biscuit au citron, gelee de fruit de la passion, ganache chocolat au lait et fruit de la passion.” It was basically a chocolate popsicle filled with passionfruit, one of my favorite flavors; I didn’t eat it, I inhaled it (watch me on video here). That dessert was the first thing I thought of when years later–this year, in fact–I found Pierre Hermé’s dessert cookbook (which he wrote along with Dorie Greenspan) at the used book store on my street. I immediately snatched it up. There’s no H. Mogador in the book (that would be difficult to recreate anyway) but the recipes all reflect the surprising, thrilling dessert combinations Hermé dreams up like the mad genius he is. And while I was eager to try the dessert with coconut milk, tapioca and pineapple, the one that called out to me first was perhaps the simplest: an olive oil cake (ideally made with Ligurian olive oil) flavored with lemon and filled with raspberries. No, it’s not the most revolutionary idea (I’ve made olive oil cake before) but I was eager to try Hermé’s take on it. 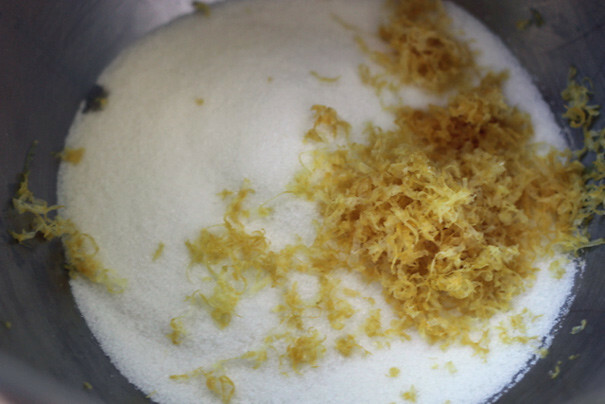 The zest from two whole lemons gets worked into granulated sugar, giving off a lovely citrusy perfume. Meanwhile, you melt almost a whole stick of butter which is pretty unusual for an olive oil cake (most others I’ve made use olive oil as the exclusive fat). 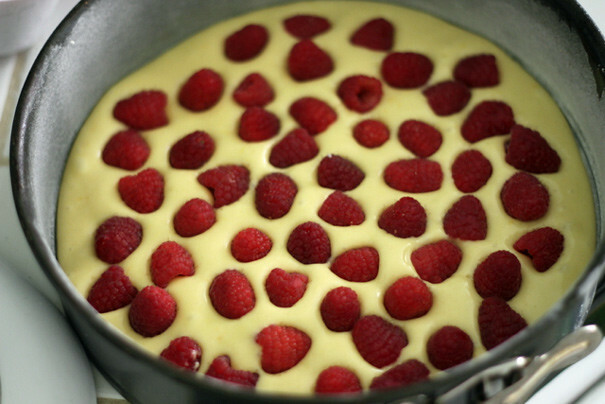 Once you make the batter–which has flour (a relatively small amount), whole milk, lemon juice, and, of course, olive oil–you smooth half of it in a pan and dot the whole thing with raspberries, topping that with the rest of the batter. Into a 350 oven it goes for 30 minutes and then out it comes. Let me be brutally honest about this cake: it didn’t wow at all like the Mogador wowed me in Paris. But that’s not what this cake is going for; this cake is meant to be simple, elegant even. It was the perfect end to that heavy dinner I made of 4-hour lamb and white beans. It’s weird to have written a post paying homage to Herme’s dazzling desserts only to share a non-dazzlnig one. But great artists can’t always write symphonies, sometimes they write little minuets. This is Hermé’s. Summary: From Pierre Herme’s dessert book. Center a rack in the oven and preheat to 350. Butter a 10-inch round cake or springform pan, dust the interior with flour and tap out excess. Place the sugar and chopped zest in the bowl of a mixer and rub the ingredients together between your fingers until the sugar is moist, grainy and very aromatic. Fit the bowl into the mixer with the whisk attachment in place, add the eggs, and beat on medium-high speed until the mixture is pale and thick, about 3 minutes. Set the mixer to its lowest speed and beat in the milk. Add the sifted dry ingredients, beating only until they are incorporated, and then add the lemon juice, warm melted butter, and olive oil, again beating only until blended. 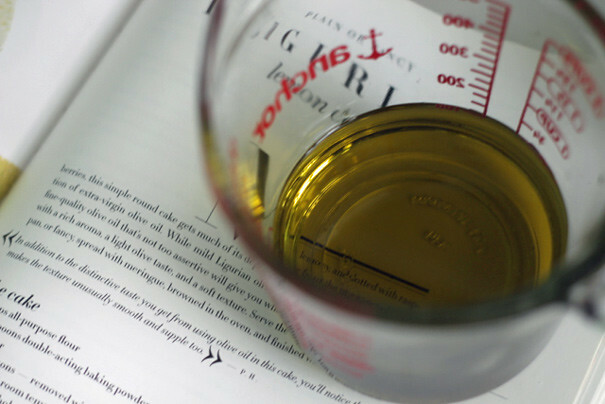 Pour about one third of the batter into the prepared pan–it should be just enough to form a thin, even layer. Top with enough raspberries to cover the batter, then pour on the rest of the batter, using a rubber spatula to gently spread the batter so that it runs down between the berries and just covers them. You’ll have a very thin top layer of batter and that’s the way it’s supposed to be. Bake the cake for 30 to 33 minutes, or until it is golden and pulls away from the sides of the pan; a knife inserted into the center of the cake should come out clean. 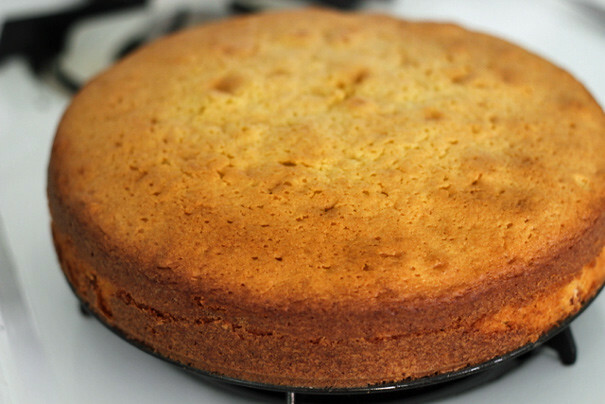 Remove the cake from the oven and immediately unmold it onto a cooling rack; invert so that the cake is right side up and allow it to cool to room temperature. Once cooled, the cake is ready to serve or to decorate with meringue.